Ok, so I have this blog for 2 reasons: 1. To chronicle my projects (since I hate journaling & this is kind of like a journal right?) & 2. To encourage all of you to create. 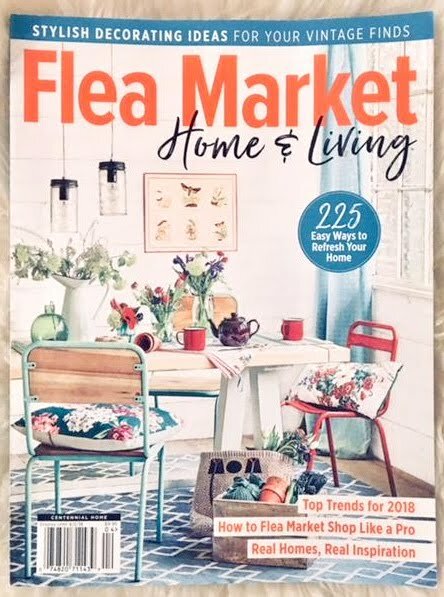 Furniture redos, pallet creations, and any other madness I do on here might not be for you, but I am a normal gal and if I can create "extraordinary" things then you can too, (whether it is a quilt, a cookie, a song, you get the idea). And if I get happiness from getting my creative juices flowing, well then you probably will too and I want you to be happy. Normally when I start off a blog post about a project I tell you how easy it is, or how you can (and should) totally try to do it too. Well I am not going to say that about this one. If you are ok with so. many. steps. then you should do this. If you aren't, then maybe you should simplify what I am about to tell you. Super cute huh? 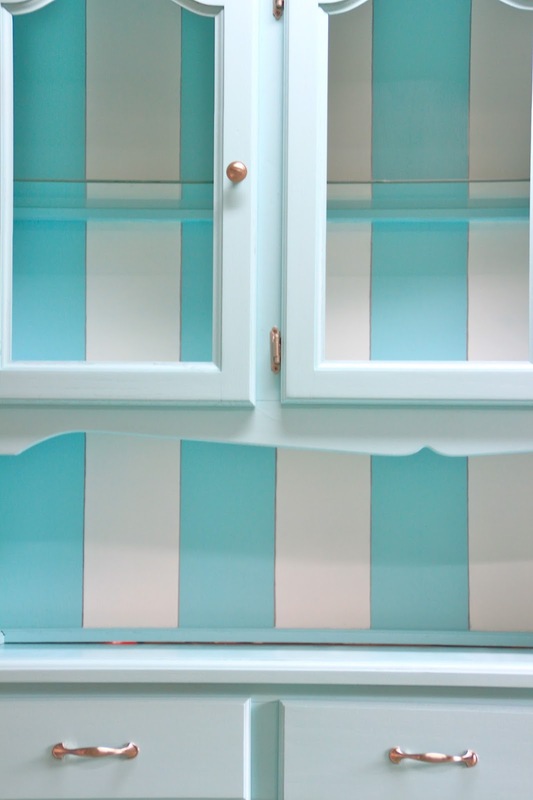 Normally I would gag at the idea of a Tiffany blue hutch with white stripes, but when you see it you can't help but go "Aww", right? What a creative woman she is at Start@Home. 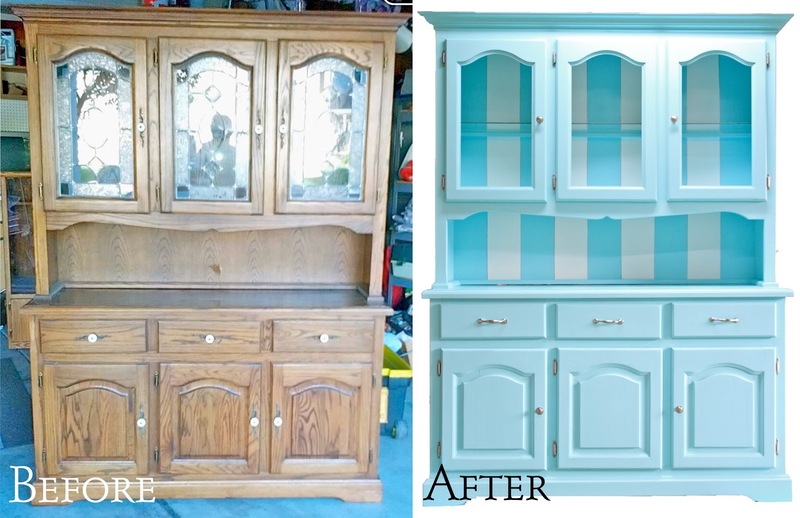 Holly and I began the process of finding a good (cheap) hutch to transform. After some convincing, we got a guy who was selling his on VarageSale (a cool app/platform for local sales) to go down to $85 for his solid oak hutch. Because it was a beast, Holly picked it up in her 12 passenger van (she has 7 kids...wonder woman I know), and dropped it off in my garage. The first step was determining the right paint color to match Tiffany & Co.'s blue. Start@Home mixed her own blue based on paint she had on hand, so that didn't help me. Holly knew she liked the Tiffany blue, so thanks to Pinterest we found a good match with Behr Sweet Rhapsody. (It is using Behr Ultra interior Semi-gloss 490A-3). 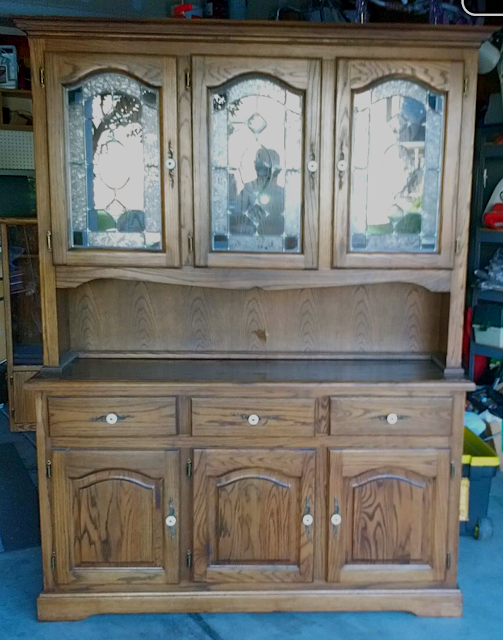 The next step was to remove the hardware and use wood filler to fill in all of the holes we would no longer be needing (since we were changing to pulls instead of knobs on some, and the decorative knobs on it added an extra hole in each of the doors). I used Elmers WoodFiller Max in the Walnut color since that was close to the oak color. 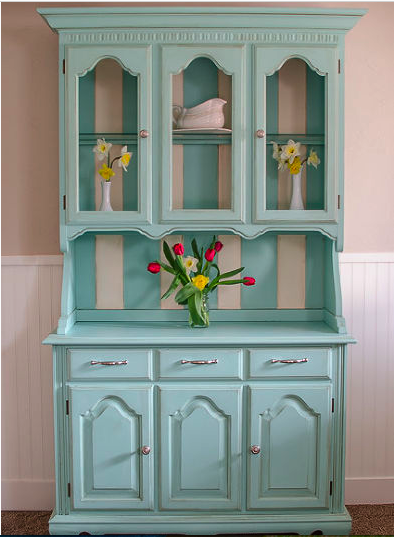 Because I was going to be painting the hutch it didn't really matter though if the color matched or not. The third step was to lightly sand the entire piece with 220 grit and then clean it all up. Sanding it and cleaning it is necessary for paint to adhere well. Here you can see the putty where the knob holes were and what it looked like sanded pre-wash.
Now the next step that I did was a dumb one and I am telling you to skip it. It didn't work like I hoped it would. I had read that if you put Vaseline on hardware (or anything for that matter) that paint will not stick to it. Since there are a lot of hinges on this I thought I would rather go this route than take off each one, and thus paint all the doors separately, etc. So I put Vaseline on all of the hinges, and painted. Do not do this. Yes it worked, kind of. I rubbed off the paint covered vaseline, but found that there is no way to perfectly cover all of the intricate hardware with it, so paint got into little nooks and crannies. Yes, I was kind of freaking out now. My awesome time saver was proving to be the opposite. I tried cleaning out every painted nook with my finger nails, and after hours of that I realized it was hopeless. I then tried to tell myself the hardware looked good that way. I knew I was lying. So I accepted defeat (all the while grumbling) and removed the hinges. I then tried to boil them in a pot I would no longer use for cooking, along with vinegar and Dawn...they should help remove the paint right? Well it kinda created weird looking hardware that really needed to be scrubbed now. I then tried to spray paint the hinges with a "metal-looking" spray paint, but it bubbled up and peeled off. AHHHHH! I know! So dang frustrating! So I sanded them down with my 220 grit and sprayed them with Rustoleum's Antique Nickel spray paint. It worked. And it looked pretty dang close to the brushed nickel knobs and pulls I had bought at Home Depot. Finally. So let's go to the step you should have gone to after removing ALL of the hardware in the first place. I then poured in the Sweet Rhapsody paint into my paint sprayer and sprayed several coats over the entire piece. Let it dry. 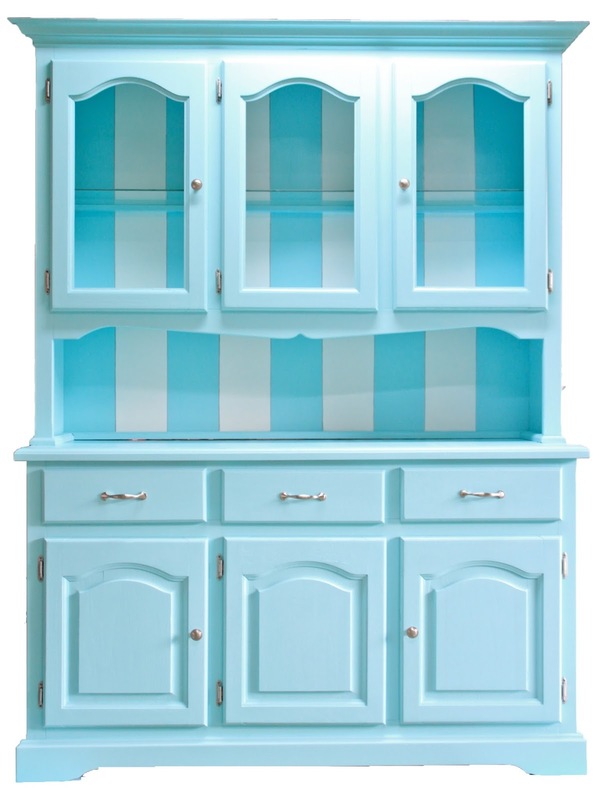 Because the hutch we were copying had the cute white stripes on the back, I needed to paint those now. I would bet money that the awesome creator at Start@Home had a hutch that already had indented lines on her hutch, and she used those as her guides for the white stripes. 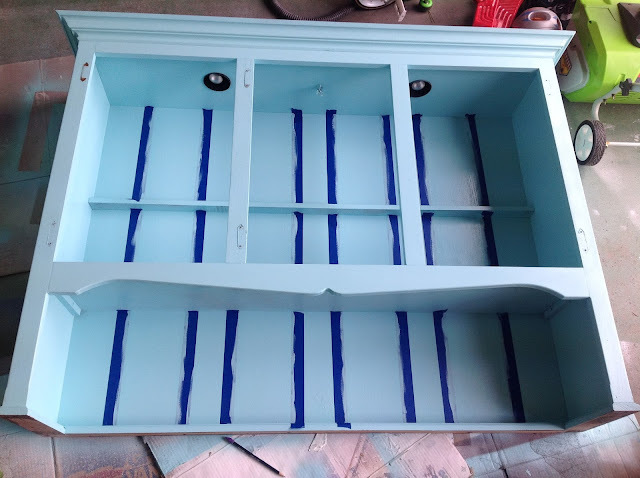 I however did not have those lines to go off, so after a lot of measuring and drawing lines, I finally had a guide for where to put painters tape. I fortunately read a tip on Pinterest the night before on how to get perfect lines when painting without the little bit of paint bleed that always happens and ruins your perfect lines. It said put you tape down and then paint by/over the tape with the base color. What happens is that the base color bleeds under the tape and when you paint your 2nd color over the now dried base color, it doesn't bleed! Brilliant and it worked! I determined which stripes were going to be the white and taped on the outside of those lines...all lines were going to be the same width, but when taping it won't look like that. This picture was taken with my kind of "smart phone" and thus isn't the best quality. However, I had to document how perfect my stripes were after following that brilliant tip. Unfortunately I did a silver line over that perfect line, and the silver was impossible to make straight like that. Oh well. It was perfect for a short time. The white paint I used was using Behr Pro interior eggshell that was colored to match Benjamin Moore's "Simply White" (2143-70). 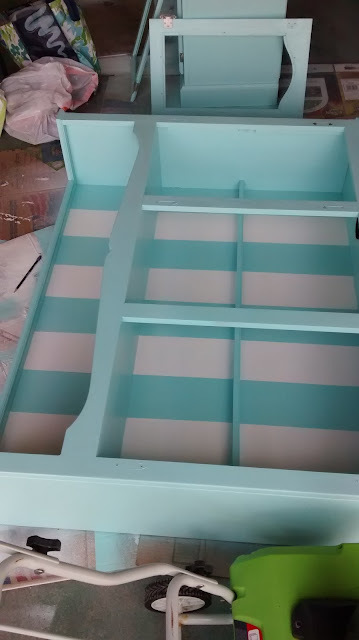 I happened to have this white on hand and knew it would be great for this project. I then took a silver paint pen and shook, and shook, and shook, and dabbed, and dabbed and dabbed (a million times through the drawing/painting process) and drew silver lines in between the blue and the white stripes. Although my perfect lines were no longer perfect now, the lines did "pop" more. And I happened to go to Michael's today and saw that Martha Stewart makes a silver metallic acrylic paint. Wish I knew that. I would have painted the lines oh so carefully instead of dealing with the frustrating, always drying out, paint pen. I then marked where I needed the drawer pulls to go and pre-drilled those, and the knobs all had holes that were there previously. I screwed in all of the new hardware (and purposely skipped adding hardware to the middle cabinet doors on the top and bottom because the hutch I was duplicating did not put knobs on those and Holly wanted it to be similar). The woman at Start@Home then glazed over her piece, which brought out all of the cool intricacies on the piece she was re-doing, but since the one I was re-doing didn't have all of those intricacies, and we wanted a cleaner more blue look, we decided to forgo that step. Anyway, I think that is it. Doesn't sound like a lot, and if I knew all of those steps going into it, and what not to try and what to do from the get go, then maybe it would have been a lot easier. Or if you are awesome at measuring and drawing lines, and know not to use Vaseline on hardware, and yada yada yada, in essence if you are perfect at everything you do, well then maybe it will take you a fraction of the time (and headaches) it took me. Good for you :). Oh and I forgot to mention that we took out the original windows and left them empty. Rather than have the original 1980's rose details, or put in glass that would only need to be cleaned, Holly asked that I leave them as is to cutely frame whatever she chooses to display. The blue stripes are the same blue as the rest of the piece, but with shadows and lighting differences, they look somewhat different. Just so you know, they are the same. So what do you think? Are you bold enough to have a big Tiffany blue hutch with white stripes in your home? Do you have any creative ideas that you would do differently such as things to put in the windows? Please share your experiences and idea cause I love hearing from you!